Who says you can’t go mountain bike riding, on the trail with your road bike? If you like riding a bone shaker down a cobble stone lanes or some of the city streets badly in need of repair, then have fun. Not recommended for reasons of agility or comfort we recently captured this Pic of a guy out in front of several traditional mountain bikers riding in Lebanon Park, near Lakeville, MN. 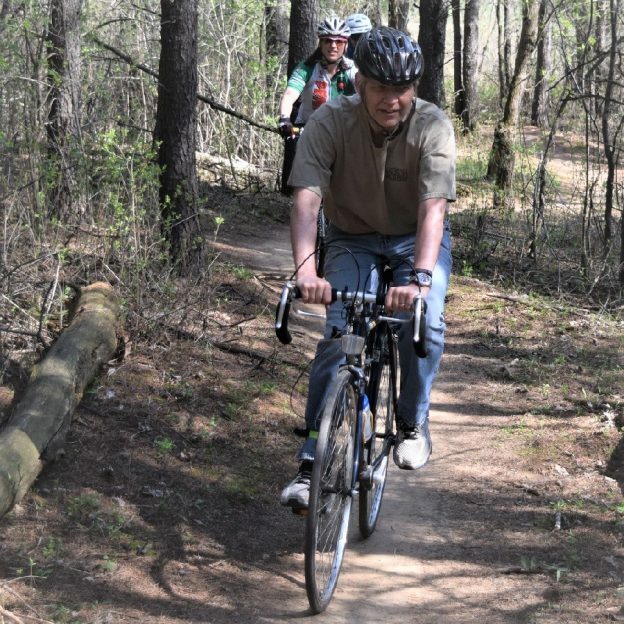 This entry was posted in News and tagged Biking Lakeville MN, bone shaker, cobble stone lanes, Lebanon Hills Regional park, Minnesota trails, Mountain bike roadie, pic of the day, road bike, rough ride, trail riding on May 16, 2017 by Russ Lowthian.